There’s something bad happening in Booger Woods, and it’s this song. The pleasures of a story are many. We can enjoy it for the action, incident piling upon incident, and seeing how the whole thing works out. Or we can revel in the telling, the little details that ring true and bring the story to vivid life. In the hands of a masterful storyteller, the action and the details become a satisfying whole we can enjoy again and again. In song, it’s why “The Wreck of the Edmund Fitzgerald” by Gordon Lightfoot is still irresistible after all this time. And it’s why the Charlie Daniels Band’s 1980 country-rock hit “The Legend of Wooley Swamp” is one of the World’s Worst Songs. Something bad is going on out there, way back in Booger Woods: “they say the ghost of Lucius Clay gets up and he walks around.” He does not materialize, neither does he creep—he merely gets up and walks around, like he was a coronary bypass patient on the second day. Clay was a greedy old man who kept his money in Mason jars, except “on certain nights if the moon was right / He’d dig it up out of the ground / He’d pour it all out on the floor of his shack / And he’d run his fingers through it.” Fetishes are creepy, but why we’re dragging the moon into one so pedestrian is a mystery. It’s easy to guess where the story is going: the Cable boys (who are, among other things, “belligerent when they speak”) decide to rob and murder the old man. They stuff him into quicksand and steal his money, only to end up sucked into the quicksand themselves. Which is why 50 years later, you can still hear boys screaming and an old man laughing at “a spot in the yard in the back of that shack / Where the ground is always wet.” It’s a swamp, fer chrissakes. Isn’t a swamp always wet, even if nobody’s been murdered there for revenge? Granted, if you realized you were about to be murdered for revenge, you might make a wet spot, but I don’t think that’s what Daniels meant. Ultimately, “The Legend of Wooley Swamp” is remarkably lazy. If it were a creative essay in a high-school English class, it would get red-penciled: “needs more vivid detail.” In a more advanced class, the note might be, “lacks narrative drive.” It’s a first draft that got handed in when the assignment was due. 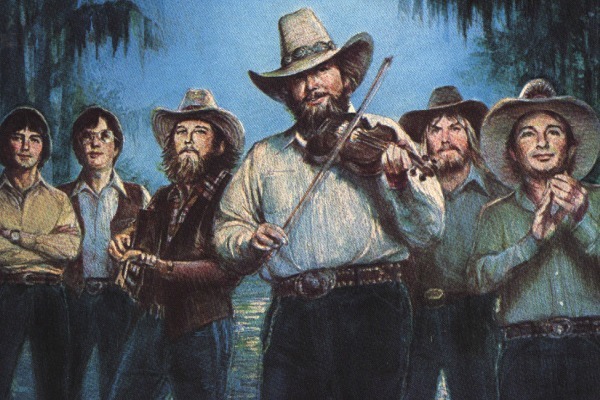 By 1980, a lot of country rock was country only because of the zip code it came from, and not because it sounded country, and “The Legend of Wooley Swamp” is an example of that. It’s a straight-up rock arrangement, and a fairly dull one at that. Daniels’ North Carolina drawl is the most country thing about it—apart from setting the song in a place called Booger Woods, which is awesome. “The Legend of Wooley Swamp” made it to #31 on the Hot 100 in October 1980. Even when you hear it in the context of its times, on one of those vintage Casey Kasem countdowns that are broadcast around the country every weekend, it sounds weird and out of place. This is partly revisionism, because Daniels’ early 80s hits were not heard on the radio much after they dropped off the charts, and they aren’t turning up on your local good-times-and-great-oldies radio station. But it’s also partly because in the early 80s, “Wooley Swamp” was part of country rock’s last gasp, a genre getting by on fumes.